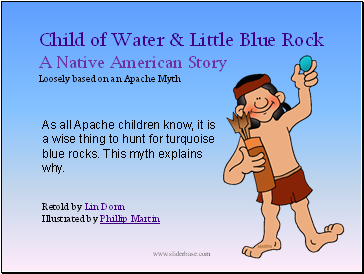 As all Apache children know, it is a wise thing to hunt for turquoise blue rocks. This myth explains why. Once upon a time, a long time ago, four horrible monsters lived on the earth. They loved to catch the People and eat them. Whenever the monsters approached, all the People ran away. 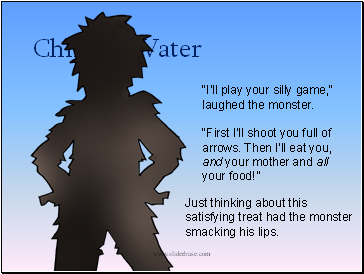 One night, a monster stomped up to the wickiup of Child of Water and his mother. 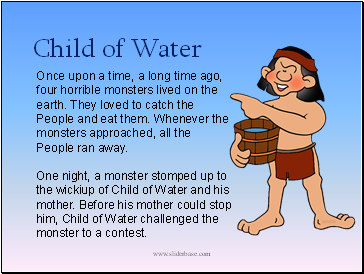 Before his mother could stop him, Child of Water challenged the monster to a contest. 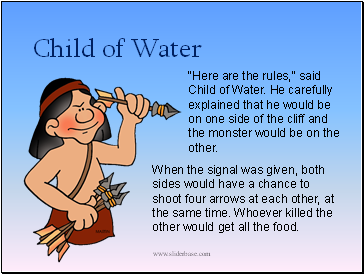 "Here are the rules," said Child of Water. He carefully explained that he would be on one side of the cliff and the monster would be on the other. When the signal was given, both sides would have a chance to shoot four arrows at each other, at the same time. Whoever killed the other would get all the food. "Do you accept these rules and promise to follow them?" chanted Child of Water, in the way of the people. 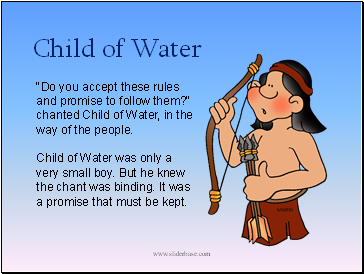 Child of Water was only a very small boy. But he knew the chant was binding. It was a promise that must be kept. "I'll play your silly game," laughed the monster. Just thinking about this satisfying treat had the monster smacking his lips. As both fighters took their positions, Child of Water noticed a blue rock. He pick it up curiously. The rock was a gift from the gods, a thing of protection. But Child of Water did not know that. 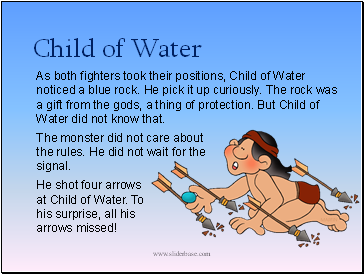 He shot four arrows at Child of Water. To his surprise, all his arrows missed! The monster did not care about the rules. He did not wait for the signal. 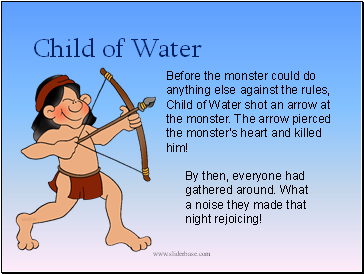 Before the monster could do anything else against the rules, Child of Water shot an arrow at the monster. The arrow pierced the monster's heart and killed him! By then, everyone had gathered around. What a noise they made that night rejoicing!